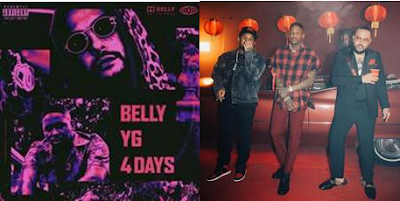 Multiplatinum-certified Academy® Award-nominated and GRAMMY® Award-winning rapper, songwriter, and producer BELLY drops the official video for his brand-new song “4 Days” [feat. YG]. It’s available HERE via XO/Roc Nation/Republic Records. Produced by L.A. powerhouse DJ Mustard, “4 Days” sees BELLY adopt a sizzling West Coast swag. He pops off with scorching bars and locks into a lyrical crossfire with multiplatinum 21st century Cali king YG. Together, they turn up with the kind of heat that classic collabs are made of, bringing together “The 6” and South Central like never before. Additionally, the music video taps into throwback energy and style from the golden age of MTV in the early 2000s with foreign cars, models, fur, and a whole lot of bling. It’s an early look at what’s to come from BELLY’s forthcoming new project, Midnight Zone, due out later this year. “Man Listen,” previously released via XO/Roc Nation/Republic last year will also be on the track list.